Hi, everyone! I am Nina, a new member from Russia. I’ve joined JF blog team for 2011. I’ve been working at Japan Foundation Moscow Office for only 10 months. I hope we will make a nice ‘blogger-reader’ team. Russian saying goes: “When the work is done, go have your fun.” Since I 100% agree with these words I cannot have fun until I’m done with my work. So that’s why this time I’ll also begin with the work topic. It wouldn’t be too much to say that nowadays there is a “Japan boom” in Russia. Though I should notice that it is more of a Japanese pop-culture boom rather than a traditional Japanese culture boom. A lot of young people wear Harajuku style clothes, join Cosplay fashion. The part of the Japanese culture - which you can easily understand and which you can fall in love with from the first sight - is extremely popular here, in Moscow. At JF Moscow Office my work is to attract people’s attention to a more profound side of the Japanese culture. We show and try to make understandable the side of the Japanese culture which probably needs time to be realized and accepted, the side that may be even shocking, the side you are going to adore with every single cell of your body. We welcome culture workers from Japan and try to do our best to hold the meeting of the Russian auditorium with the amazing Japanese culture smoothly. It was a very brief explanation of my activities. I will present you other sides of my work while meeting you here during this year. 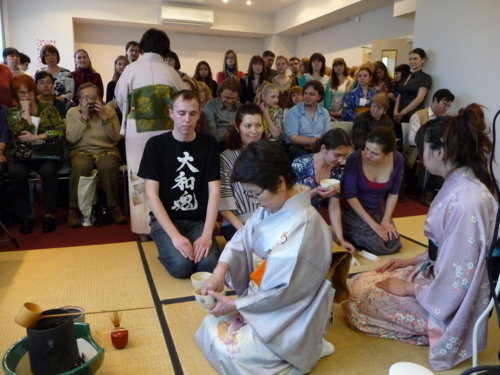 A workshop on the Japanese tea ceremony (School Omotesenke), which was held in May gathered surprisingly many - about 65 - people. Well, and now I guess we can move to another topic. I start walking, faster and faster and then run. “And what about ‘Dream’?” you may ask and start giving me your guesses such as: “Do you walk and run in your nightmares?” But no, my friends, ‘Dream’ doesn’t mean that I see myself walking and running in my nightmares. By “DREAM” here I mean “imagining something that is difficult to achieve”. Welcome to my world of Dreams. I am not totally in dreams, though. Anyways, to make the long story short, I am just like you, every one of you: working, studying, dealing with everyday problems, going out with friends, dreaming, going through difficult times and through happy times and dreaming again. And I am eager to share my world with you! So let’s keep in touch from now on! NINA. And greet the next blogger -Any!